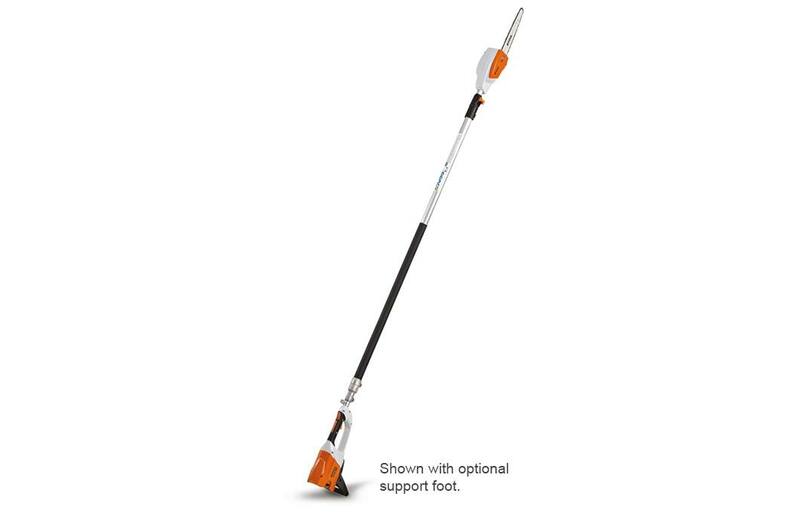 A 12' telescopic pole pruner, powered by 36-volt Lithium-Ion battery technology. Batteries & chargers can be purchased separately or as a combined set with tool. Homeowners and tree care professionals now have a quiet, zero-exhaust emission, low vibration option for trimming overhead branches. The STIHL HTA 85 Lithium-Ion battery pole pruner offers lightweight, balanced cutting thanks to its brushless, commercial-grade, high-torque electric motor. Part of the STIHL battery-powered line, the HTA 85 runs on the same interchangeable battery system as other STIHL Lithium-Ion tools and offers long run times on a single charge - up to three hours depending on which battery - with no gradual drop in performance. The HTA 85 telescopes to 12 feet for those tall tree-trimming tasks and requires minimal maintenance since it has no engine or filter. Best of all, there's no gasoline cost and no restrictive power cords. Batteries & chargers can be purchased separately or as a combined set with tool. Overall Length: 8.2" to 12.1"